Blondie and Brownie: School's Out Forever! New Blog Posts TK! Hey, guys!! I know I've been gone from the B&B beat for a long, long time. Well, a few things went on: 1) I got a job, 2) I made a resolution to enjoy my friends (read: be more social!) more often and 3) I was in my last semester at NYU. But, guess what?! NYU's done--yay, I have a MA--and all this time off the Internet has made me want to get back on the Internet. So starting next week, I'm coming back with a few posts about Italian products you should seek out during the winter break. And maybe next year, we'll have a little facelift here on the B&B? But until then, go check out my capstone project. Yea, I made another website, too. 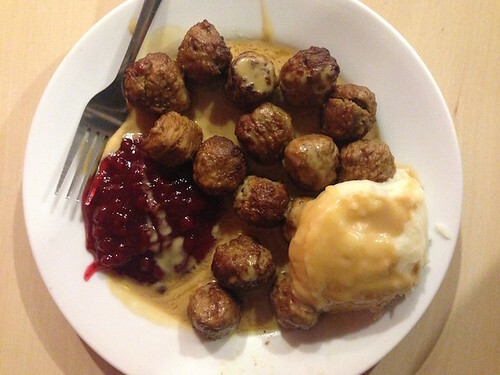 Oh, and these are the IKEA meatballs I ate over Thanksgiving weekend. It was my last square meal for a while.